See the ITINERARY at bottom of the page. 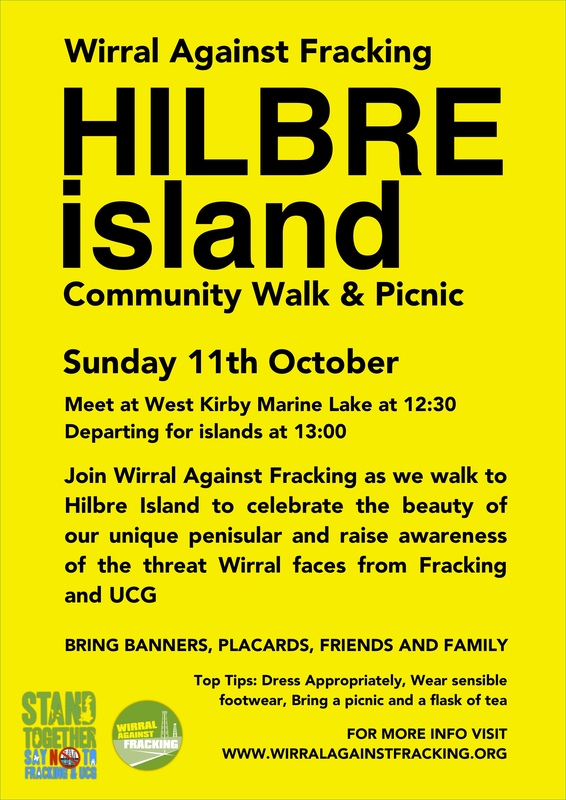 This Northwest event is held in support and solidarity with the big event in Scotland, we will walk across the sand to Hilbre Island, where we too will hold hands to show our community united against UCG. We hope for a good turn out and a great aerial photo. Bring your homemade banners / signs! This a family day out, so bring the kids and buckets & Spades are encouraged for fun when we get there! Dogs are welcome on a lead. Bring yourself food & drinks. Tell your work mates & neighbours! We plan to gather at West Kirby Marine lake at 12.30, and the walk will be leaving at 1pm. We will be going whatever the weather! Please dress for all weathers & wear boots or wellies. This is a day to appreciate our beautiful Dee and appreciate that we all need to stand together to protect our amazing home from the short sightedness of this unnecessary industry. 12.30 – Gather together at West Kirby Marine Lake, near to the beach, opposite Morrisons. There is a large public car par there too. There will be music by local musicians and an opportunity to collect information and socalise. 1pm – Photo opportunity with your banners and signs, so we can send our picture to the Scottish event to show our solidarity. 1pm / 1.30 – We depart for the islands. On arrival we will assemble for our picture out on the sands of the Dee. Our group will stay a while to enjoy the peace and natural beauty of this area. You can stay as long as you wish, but we advise you either leave with the group or at a time to ensure you are back before 5pm. Community organizing for the win!!! – It’s about the strength and visibility of our collective opposition. It’s about our communities vs the industry. Regardless of the decisions made – it will be about whether the industry can afford to go through nation-wide ultra visible, organised resistance. Help us inform the communities on the other side of The Dee about the plans to build an experimental Underground Coal Gasification plant between Northwest Wales & the Wirral. Volunteers are urgently needed on BANK HOL MONDAY 4th May, to do the information stall at Llanasa Village Car boot, Flintshire, CH8 9NF. & Sat 9th & Sun 10th May in Prestatyn. Lifts can be provided, please contact WAF at protectwirral@hotmail.com to offer your help, including your phone number please. 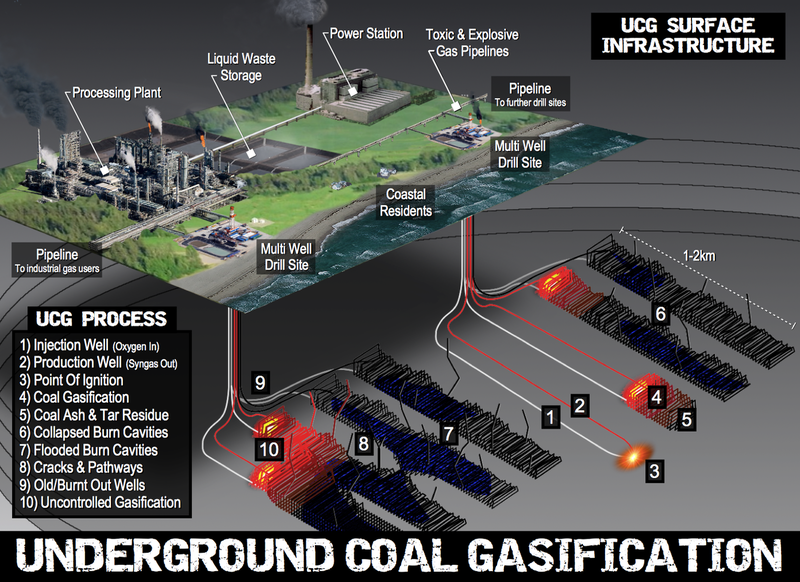 A license has been granted to allow a controversial method to extract gas from the coal bed deep under the Dee estuary. The Point of Ayr License covers 6,953 Hectares of the Dee estuary, and was sold to Cluff Natural Resources Ltd, to allow the experimental process of Underground Coal Gasification (UCG). There are major concerns around the safety of UCG, and is often one of the three controversial techniques referred to in the media as ‘Fracking’. UCG is a process that is still at an experimental stage. It is an attempt at reaching the coal that is inaccessible by conventional methods. Bore holes are drilled into the coal bed, deep underground, and the coal is set alight. Once the combustion has started, the fire is starved of oxygen in order to produce a mixture of gases, Syngas, which is extracted for processing at the surface. Also a wide variety of toxic hydrocarbons are produced, of particular concern are the known carcinogenic Benzene, Toluene and Phenols. UCG is still an experimental process, small trials have been done in Turkey, Hungary, South Africa, USA & Australia aiming to prove its commercial viability. A number of publicised failures have followed, with contamination of ground water from Benzene, Toluene and Phenols, in one USA report groundwater was still polluted 20 years after the trial. In 2010 Cougar Energy’s demonstration plant in Kingaroy, Australia was shut down after just 5 days when an independent scientific panel detected benzene and toluene in groundwater, as well as in the fat of grazing cattle. Benzene concentrations in groundwater were 45 times the Australian Drinking Water Guidelines. As the UCG process is studied it becomes apparent that there are many points where it is unclear that the toxic by-products can be reliably contained and the local population’s health and safety may not be adequately protected. Now the UCG industry brings its trails to the UK, and the Dee estuary and so the people living near by and the unique environment of the area is under threat by the potential risks. Over on the Wirral concerned residents have formed the community group Wirral Against Fracking (WAF) and have been campaigning for the last 12 months to raise public awareness of the plans for UCG in The Dee. 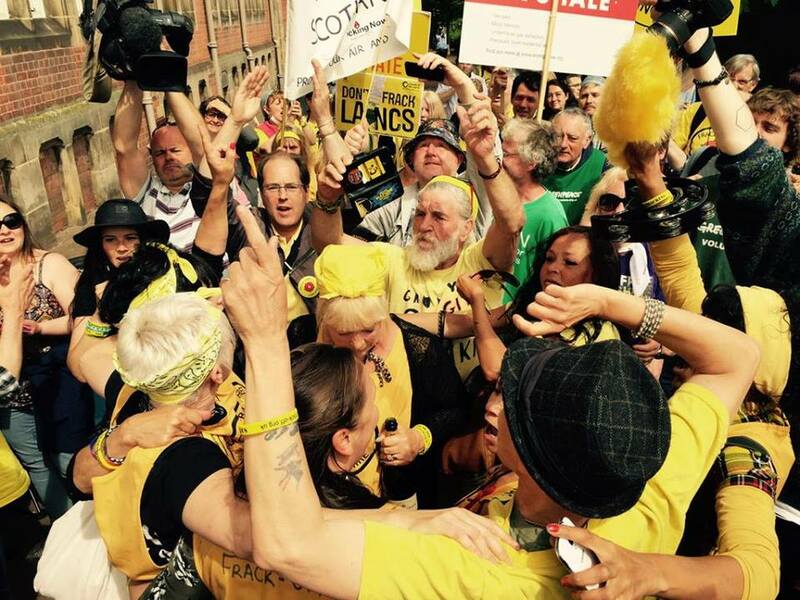 There are over ten anti-fracking community groups formed across Merseyside, Cheshire and North Wales and together they have formed a coalition group called Frack Free Dee (FFD), to pool their resources in order to oppose the fracking industry. Members of FFD are gravely concerned about the lack of public knowledge in Flintshire and Denbighshire about the real risks of UCG and are holding two public awareness meetings for the communities local to the Point of Ayr licence. There will be a factual presentation of the UCG industry and the risks laid out with references and evidence from the trials elsewhere. Then the opportunity for the audience to ask questions. FFD hope to provide the local residents of this area access to information so they can make their own informed decision on if they want UCG to take place in their own Welsh Coastal communities. BANK HOL MONDAY 4th May, at Llanasa Village Car boot, Flintshire, CH8 9NF. Wed 13th May (7.30pm start) – Old Tavern Inn, Coast Road, Mostyn, CH8 9DX. Thurs 21st May (7.30pm start) – Prestatyn Constitutional Club, 15 Eden Ave, Prestatyn, LL19 9DL. Licence area Point of Ayr – Flintshire/Wirral. WAF has a new email ! Our wafwirral@aol.com email address has been hacked & lost. Please note the venue change! Come to get together & share information on the present situation on The Wirral & UK. 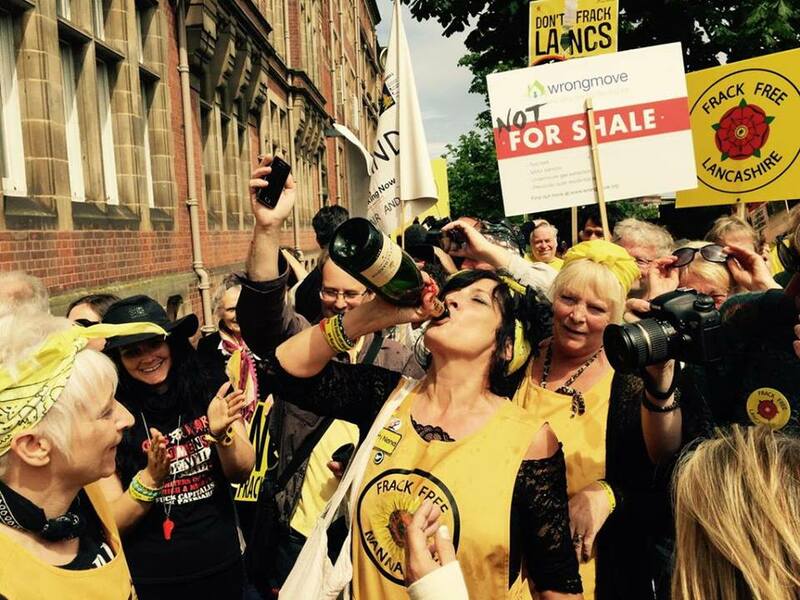 ELECTION 2015: WHO’S PROMISED TO OPPOSE FRACKING? The election is just weeks away. With MP candidates going all out to win our votes, this is a huge opportunity to push fracking up the political agenda. David Cameron’s plan to force fracking on us has already faced a huge political backlash. Dozens of influential politicians have spoken out against his reckless dash for shale gas. And in Scotland and Wales, ministers have blocked the industry from drilling. But the bans in Scotland and Wales are only temporary. And in the rest of the UK, anything could happen after the general election. These next few weeks could make all the difference. If we can persuade hundreds of election candidates to declare opposition to fracking in their constituencies, it could spark a chain reaction — triggering hundreds more to take a stand too. 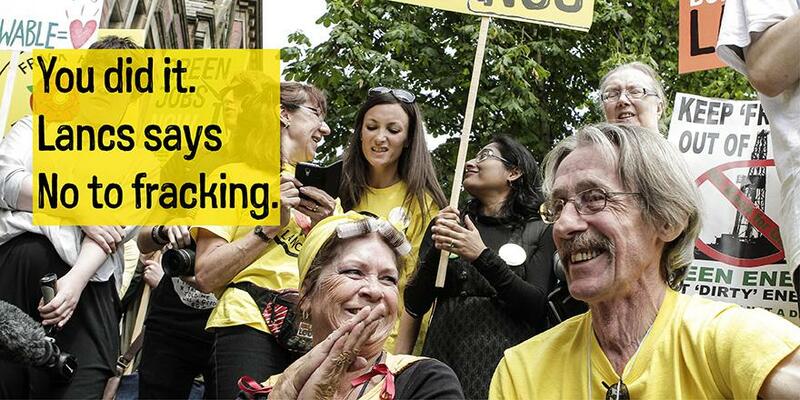 See who’s promised to oppose fracking, and ask your MP candidates to get involved. Whoever’s running the country after May will have it in their power to set the UK on a different path. Instead of locking us into risky fracking, they could choose glorious green renewable energy. They could lead the way to a future where people’s health and the needs of our planet are put before the profits of the fossil fuel industry. Let’s keep the pressure on to make it happen, so please share this!